The SXD-4503 is a rugged antenna with low VSWR and high gain covering the entire band from 330-512 MHz. It is suitable for mounting on top or side of a tower. The antenna consists of single folded dipole, vertical polarized. The antenna maintains constant gain and VSWR over its bandwidth of 15 MHz., making it highly suitable for single or multi-frequency systems. All cable connections to the dipole is sealed in epoxy for protection against moisture ingress. The dipole is mounted on a tabular section made of high strength aluminum alloy which offers a low resistance discharge path. Molded N-Female antenna termination connector ensures complete water proofing. 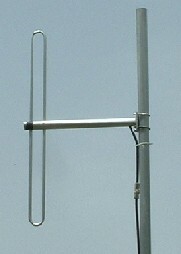 The antenna can be supplied with or without central mast.